Here's a way to section off hazard areas, construct tool rooms, maintenance rooms, stock rooms, electrical equipment rooms-- all at low cost and fast installation. Partitions are coated with a Gray enamel, providing a long-lasting smooth high-gloss finish. Quality and dependability you can't find in any other partitions. FOB Shipping Point. A) Standard Size Panelsare available in 1', 2', 3', 4', and 5' widths; 7', 8', 9' and 10' heights. Most jobs can be planned around these even foot dimensions. B) Stock Hinged Doorsare made in 3' and 4' widths and are 7' high with transom above. No transom on 7' high partition. Unless requested otherwise, doors are supplied hinged left, swing out (viewed from outside partition enclosure). C) Sliding Single Doorsare available in 3', 4', 5', 6' widths and are 7' clear with transom above. 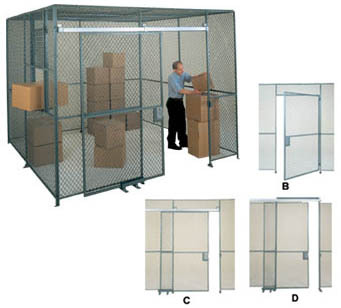 D) Full Height Single Slide Doorare made to provide overhead height up to the height of the partitioning (8', 9', or 10') and 5', 6', 8', and 10' wide. Hardware & Components Included With Panels:Floor Shoes - High grade iron casting with set screw, plus two slotted holes for floor attachment. Anchors are included. Top Capping Channels- Are 1-1/2" x 1/2" x 1/8" hot rolled channel. Two fasteners are provided with each channel. Horizontal Stiffener Channels- Two 1" x 3/8" x 1/8" channel on each side of wire mesh. 3' 3" above bottom of vertical channel bolted through mesh. All necessary bolts, nuts, clips and floor lags included. Note: All doors complete with padlock lugs only. For mortise lock add model number ML. For mortise lock add model No.HML. Price each $78.26. Ltr. Width Wt. (lbs.) Height Wall Type Description Price Ea.